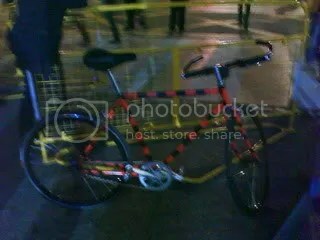 My art-ride for Nuit Blanche 2011… | Hot Jambalaya! Ever since my trip to Copenhagen last year (where I re-learned the joys of cycling) I have been cycling nearly everywhere in Toronto, all the time, on my Schwinn Hybrid I purchased at Canadian Tire. Sturdy and economical; it’s been a faithful steed. However, with respect to speed and weight, it’s kind of a pig. 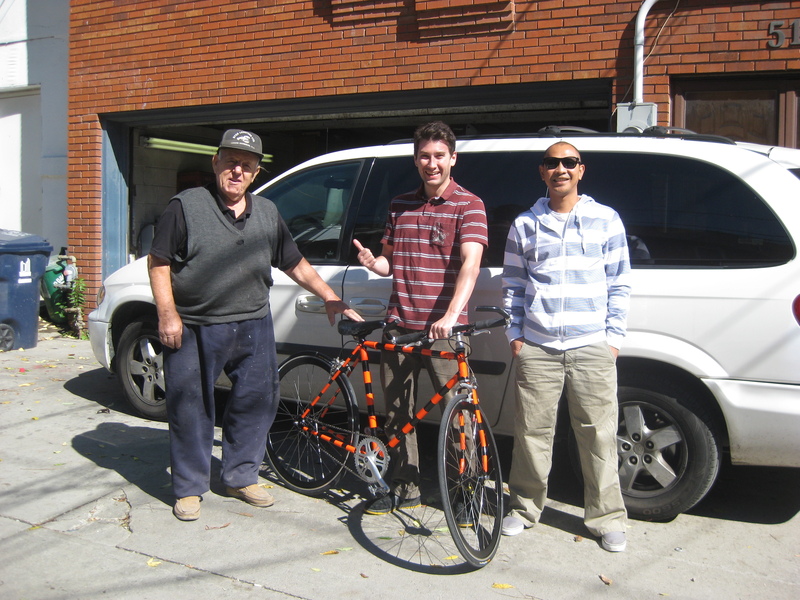 Earlier this summer Kris was showing me his home built bikes and the sleek designs of single speed/fixed gear bicycles. After seeing his blue beauty and watching him blow by me on straight-aways – despite my gears – I wanted one. Piece by piece, I collected all the parts I needed while, concurrently, working on the paint job and design of the Tiger bike. Since it’s an older frame the bike had a lot of idiosyncracies that most bike shops downtown weren’t familiar with. So what should’ve been a month – at max – job, turned into a 4 month build project. Through it all, I was lucky to have a dedicated design team for moral support and technical expertise. Eventually, I had to turn to the pros at Cogs cycle to take care of the tough stuff: the cutting and threading of the fork, bottom bracket work, and access to old-style stems. In Toronto it’s Nuit Blanche tonight. And the Tiger bike is my ride. Tiger bike in its milieu….